Sound familiar? It’s a line being used on FaceBook to promote a play called Stainless Steel Rat which is being staged from 28th June 2011 at the York Theatre, Seymour Centre, in Sydney, Australia. But don’t get excited, the play has nothing to do with Harry Harrison’s book The Stainless Steel Rat. It is actually an ‘artistic interpretation’ of the activities of WikiLeaks spokesperson and editor-in-chief Julian Assange. 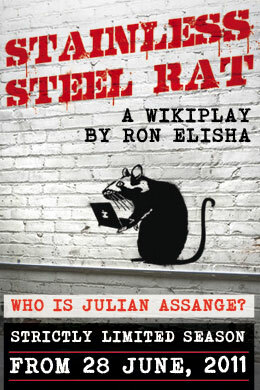 Assange is believed to have used the names ‘Stainless Steel Rat’ and ‘Harry Harrison’ as aliases online, hence the connection. Julian Assange has received a number of accolades for his journalism and campaigning for more open and accountable government; his place in the spotlight has also meant that his own private life has become a matter of investigation and speculation. Swedish authorities are currently seeking to extradite Assange from Britain to question him about an alleged sexual assault. Assange is appealing against extradition, on the grounds that the allegations are ‘without basis,’ and in the belief that an extradition to Sweden will then be followed by extradition to the United States. The British appeal hearing is due to take place on 12th July 2011. Assange is known for taking things which don’t belong to him and making them freely available. The authors of the ‘wikiplay’ Stainless Steel Rat seem to have taken a similar approach, but they’re using Harry Harrison’s creations for their own profit. Shame. These guys are ripoff artists. I’d have them in jail if I could. 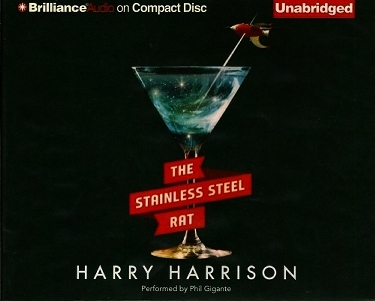 The winners of the 2011 Audie Awards — “recognizing distinction in audiobooks and spoken word entertainment sponsored by the Audio Publishers Association” — have been announced, and the winner in the Science Fiction / Fantasy section is The Stainless Steel Rat, written by Harry Harrison, and read by Phil Gigante. The five-hour unabridged recording was released by Brilliance Audio in March 2011. Congratulations to both Harry and Phil for this well-deserved award. There’s a nice review on the AudioFile Magazine website, which includes a link to an extract of the recording, if you haven’t had chance to hear any of it yet.